Well, I just mentioned the Schuman because that particular symphony is frequently paired and compared with the Harris third, and the Persichetti has drawn comparisons to both symphonies. The Schuman and Persichetti both have quite an edge to them. The Harris just seems a bit too "pretty" and lean and just "sounds nice" and nothing more. Do try again on Schuman, and get around to Persichetti sometime. They're both great symphonists, in my opinion. Harris? I'm not so sure. I like Harris and Schuman very much, have a lot of their music. That said, to discuss whether their music is great or not, is a very personal one. And that's my criteria, if I like it its good, if I like it very much its great, whether or not others agree with me. Life is so simple. Listening to all these symphonies one after another made me think about this thing about every Harris symphony being a mere re-tread of its predecessor. It started me thinking that maybe the problem isn't Harris's lack of innovation,maybe it's us. Some how because Harris wasn't outwardly a geat innovator,that he approaches each symphony in the same kind of way,or at least appears to,makes him a bad composer. 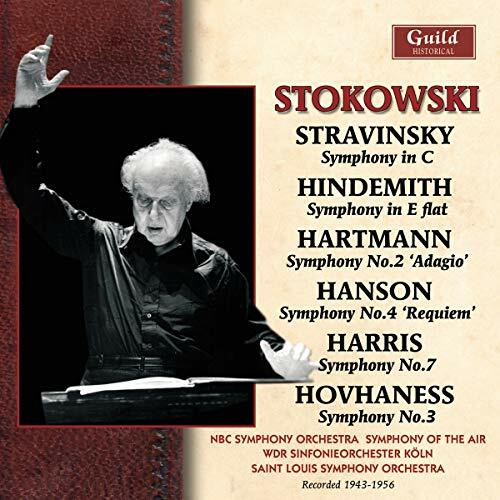 Yet,the more I listen to these symphonies the more I find that Harris is actually quite an adventurous composer. While,superficially, each symphony tends to follow a similar pattern,it seems to me that in each symphony Harris is exploring all kinds of interesting timbres and textures,and furthermore,if you listen to each symphony in turn,there is this feeling that,far from being a mere re-hash of it's predecessor, each one grows out of the one before it,as if through subtle changes & procedures Harris's music is gradually evolving,almost like some kind of musical organism. Listening to Harris's Seventh is a case in point. On a superficial level Harris is just repeating the old formula (of the 3rd) and hoping it will work again. All those striding chords,stabbing-growly brass interjections et al leading to a big triumphant climax with all the usual trumphant brass & percussion,only without a memorable tune that you can hum in the shower. But the more I listen,the more I find all kinds of subtleties & refinements in Harris's orchestration. In fact,the more I listen to the Seventh,the more I'm starting to feel that it is actually in many ways a more subtle and interesting work than it's famous predecessor. Also,on a purely visceral level I find this music VERY exciting. The eighth symphony on the other hand,does seem like a disappointment at first after the conciseness of the Seventh. It seems almost like a garrulous, extended tone poem that doesn't seem to quite know when to stop. But again,the more I listen,the more I find all kinds of interesting timbres and textures there & Harris's use of the piano is quite gorgeous. This is music that really tickles the ear! My feeling is that this is actually quite a departure from it's predecessors & that there is some kind of underlying logic there & maybe we're just too blinded my traditional structure & form to appreciate it. Either way,this is gorgeous sounding music & personally I think the best approach is to just let those tinkling textures and piano sounds wash over you like some kind of exotic mid western bath! After this one Symphony No 9 DOES seem almost like a step backwards & while some of it is quite impressive,I don't think it's one of his best. Well,not yet,anyway! Interesting to compare the eighth with the Eleventh. There are so many similarities there,on the surface. Again there is some of the same inexorable tread of the Seventh,but like the eighth a feeling that the whole work is more like some kind of exploration in textures & timbres,culminating in a suitably sonorous conclusion than a conventional symphony. A bit like the 7th in form,but more 'exotic',refined and without all that brazen patriotism. Incidentally,Mirror Image,if you DO want to have another go at Harris's fifth & sixth at their best,I really would urge you to get hold of the Pacific SO recording of the Sixth & the old Louisville recording of the Fifth,as well. The Alsop performance of the Sixth is very unsympathetic to Harris's idiom (I think it's awful!). The earlier recording of the fifth has more atmosphere & momentum;but the Alsop/Naxos performance of No 5 isn't too bad & will enable you to evaluate the piece in up to date sound! WARNING! : This may permanently damage your opinion of RH, but, hey,... I just chalk it up to the '70s! Without question,a misunderstood,neglected masterpiece & I will now spend 800 words explaining why! Actually,I think this is the one Dundonnell keeps warning us about! In the words of the Chuckle Brothers ,Oh dear,oh dear,Oh dear! I can't even see a front rank orchestra doing much with that one....or wanting to!!! Roy Harris's No 1 achilles heel,his staunch patriotism! Yuk! Still,even Beethoven had his Wellington Victory.........although,that was a shattering masterpiece by comparison! DON GILLIS IS THE MASTER!!!! Anyone want to continue this thread?!!! Admirers of Roy Harris should enjoy this new release of his 7th Symphony in a historic recording, coupled with the excellent David Diamond's moving Symphony No 4 (in memory of his Father). The Hovhannes is very good too. As for William Schuman, I admire Symphony No 3 and consider his 6th Symphony to be one of the greatest American symphonies (the Naxos version is excellent as is the old Ormandy on Albany. Some interesting historical perspectives there,Vandermolen. Not sure that link works ,but I found it on Amazon.co.uk,anyway. I see you can download individual works (from the 2 cd set) there,if you don't want the whole lot! Ormandy's Seventh is available separately,too. So many times you think you can just download what you want,only to be greeted by,"Album only! " Hanson's 4th is currently my favorite of his symphonies. This looks like great disc. I am afraid that I did warn you about the Bicentennial Symphony and I regret to say that Nos. 10 and 12 are not much better. No.10 "Abraham Lincoln" is scored for speaker, chorus, piano, brass and percussion and No.12 "Pere Marquette" for tenor, speaker and orchestra. What's another Symphony (by someone else) that makes you sad like this? I MUST know! A few more people will discover the 3rd, read this Thread,... and then some will get a few more well chosen discs,... and some?,... some will read this Thread, and STILL go out and buy everything Harris has. They will then come back here and pretend that they weren't warned. It's called denial. Still, the 3rd is near and dear to me. Nothing else will do. For that, his immortality (uh...on this Forum) is secure. Personally,I believe a man (or woman) should be judged by their best work & the fact that Harris's muse went off the boil,towards the end of his life,doesn't lessen my opinion of Harris's best work & I really don't see why it should. I think that this happens with allot of creative people;they run out of ideas or they get stuck in some kind of rut. In Harris's case I think he felt under allot of pressure to try and recreate,somehow,his earlier success. From my understanding of what I have read about Harris,he was a bit egotistical & he couldn't really come to terms with falling of that high pedestal. In my opinion a bit more of a sense of humour would have helped;but then it's easy to judge other people I suppose. Another point I would like to make is that,in my opinion,musical compositions that incorporate speech do tend to be a bit awful,especially ones expressing some kind of political sentiment or ideal. Although,there are decent examples. In my opinion,with the right speaker,Arthur Bliss's 'Morning Heroes' is actually quite stirring. But then again,Bliss wasn't such an egotist & seems to have had a sense of humour. Listening through piles of Roy Harris cds this week,a sense of humour really does seem to be the one thing that was badly missing. All those sonorous brass interjections and that solemn striding patriotism can get to you after a while! Copland and Ives,unlike Harris,knew that the best way to make serious music truly appealing,was to leaven it with a bit of humour,which is why,after ten hours of non stop super patriot Roy Harris,Coplands great third symphony feels like dancing around in a feather coat (not that I ever do,of course! ). Having said that,I DO still feel that there IS more to Harris than the third & I would rate,just a small handful,very highly,although,I'm not saying I believe there are any great masterpieces there. Even I have to admit that the third has got to be THE high pinnacle of his achievement,although,maybe No 7 is,in some ways,arguably more subtle? And then there's No 6,which is in my opinion,a tremendous achievement,although here again,maybe Harris piles on the patriotic rhetoric a little too obviously. Which brings me back to Don Gillis,and the fact that,whatever you might think of his music or his symphonies,at least the man had a sense of humour. In fact after ten hours of non stop Roy Harris,Don Gillis's Star Spangled Symphony might just be the perfect pick me up! I am glad that Harris is getting a little back and forth here. I took the 3rd with me yesterday but didn't get around to it (will soon), and may look into some of those old Albany discs. Besides,... ANYTHING to keep the Brian Thread from the top, haha!! As a regular there,I must admit,I DO actually find that quite funny! Well,the Henry Cowell thread didn't work!!! Actually,what Havergal Brian has that Roy Harris doesn't have is a cult following! How do we turn Roy Harris into a minor cult figure? It could do wonders for his cause! Maybe that Bicentennial Symphony could have some value after all?